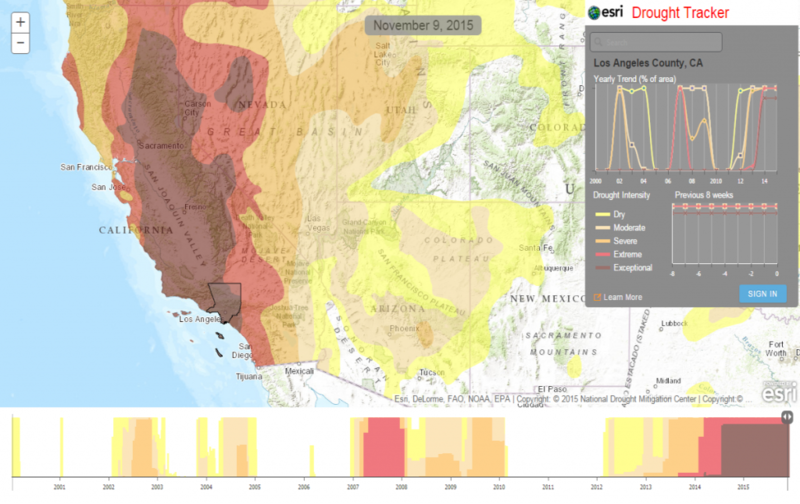 Esri Drought Tracker allows anyone to explore the current and historic levels of drought intensity affecting the USA from Jan 2000 to present. Drought is a prolonged period of less than normal water conditions. Drought can be recognized as a few short days of a dry spell, a longer period of weeks affecting some crops or reducing harvest. Drought can be more severe producing harsh crop damage and requiring voluntary water-use restrictions, or in its worst cases, drought can devastate crops and livestock reducing reservoirs to empty bowls of dust. In all cases, the effect of drought is a cumulative progression of time and that long-term effect helps us understand the severity. Exploring the map and graphs allow anyone to look at the current drought conditions in the United States, zoom to California and look at current conditions or look back at drought conditions in West Texas in 2011-12. The app makes it easy to explore both time and drought severity of any county in the U.S. For the GIS user community, the app allows a user to sign in and set the map to any specific time and save the map. Once the map is saved you can mash it up with other map content, perform online analysis, or share your custom map with your organization. To use the app open Esri Drought Tracker on your web browser. Pan and zoom to an area of interest and click your mouse on the map. The app will identify the county and return a time and drought severity graph along the bottom and a set of summary graphs in the Drought tracker panel. The graph at the bottom shows the entire history of the percentage of area in drought for the selected county and the drought intensity. Using the mouse, you can move over the graph and see details of drought for any given week. Click on a time on the graph and the map will update to that time. The Drought Tracker Panel includes two additional graphs the top graph shows historic drought on a specific day for each year. The other graph shows the previous 8 weeks of drought at any time you have selected. The 8-week trend is a factor in determining eligibility for some USDA drought relief programs. The U.S. Drought Monitor, established in 1999, is a weekly map of drought conditions that is produced jointly by the National Oceanic and Atmospheric Administration (NOAA), the U.S. Department of Agriculture (USDA), and the National Drought Mitigation Center (NDMC) at the University of Nebraska-Lincoln. Every Thursday the U.S. Drought Monitor releases an updated map of current drought conditions. The map is based on measurements of climatic, hydrologic and soil conditions as well as reported impacts and observations from more than 350 contributors around the country. 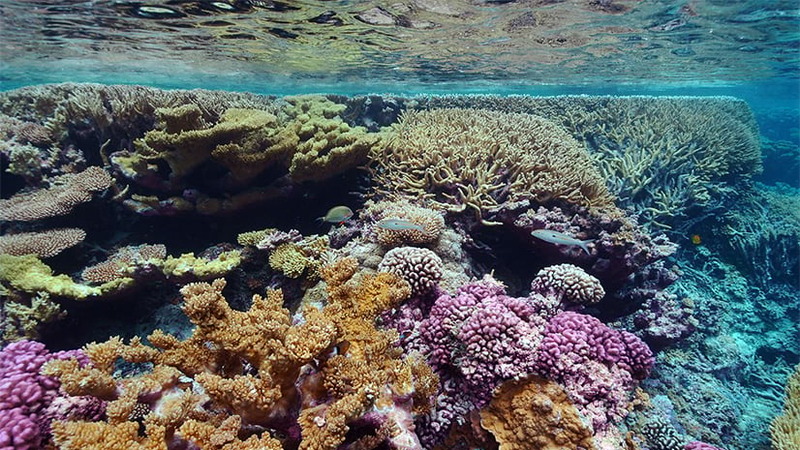 Eleven climatologists from the partner organizations take turns serving as the lead author each week. The authors examine all the data and use their best judgment to reconcile any differences in what different sources are saying. 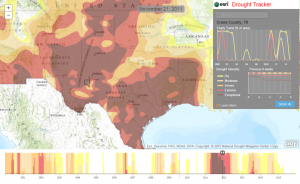 The U.S. Drought Monitor program has a wealth of drought condition data from Jan 2000 to present. 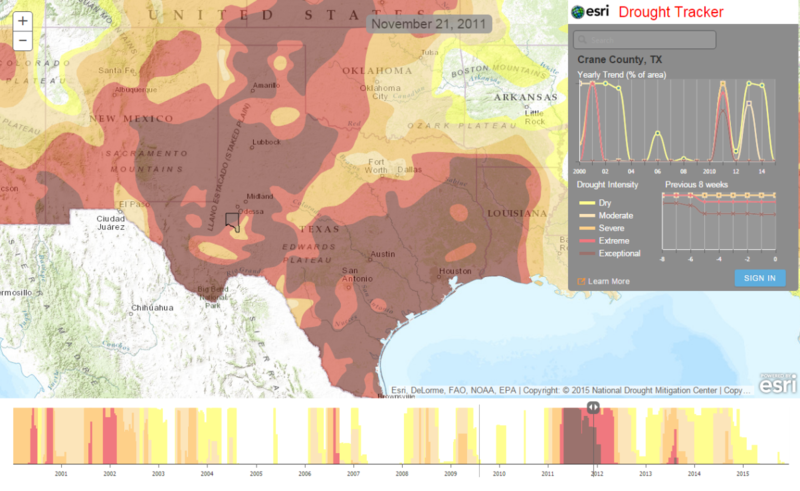 Esri with support from U.S. Drought Monitor program is now sharing that data in an easy to consume map service. 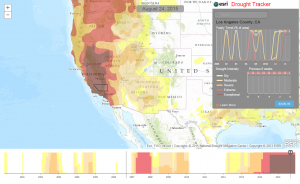 The map service contains the complete set of Drought Intensity Areas across the U.S. We also developed an easy to use application that will allow anyone to explore this vast collection of data and see the short and long terms trends of drought. Additional drought content is available to the GIS community for custom mapping or analysis in the Living Atlas of the World. To access the full set of historical content Jan-2000 to present go to USA Drought Intensity 2000 – Present. To see only most current weekly map go to USA Drought Intensity (Current Conditions). These maps and layers require an Esri subscription login. To learn more about ArcGIS and get a trial subscription visit ArcGIS.com.